According to the forums, problems with the SMB share seem to be one of the most frequent issues. This article will help you work through those issues. It is written specifically for Windows installations, with the share being located on the CloneDeploy server, but the concepts can be applied to any OS or remote share. Typically when installing CloneDeploy using the automated Windows installer, all components are setup and ready to go out of the box. For a small percentage of users the SMB share does not get created properly. I am still unsure why this only effects certain users. 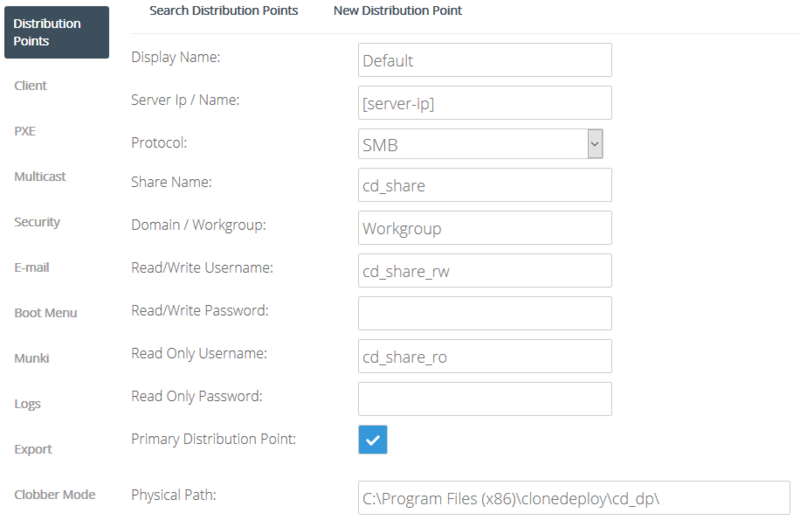 CloneDeploy uses a standard share for uploading and deploying images, it requires that all client computers connect directly to the share. The CloneDeploy Server must also have access to either the share’s physical path on the local server or the UNC path if a remote share. The following commands are run from an elevated cmd prompt on the CloneDeploy Server. All instances of program files(x86) should be replaced with program files if you installed on a 32 bit machine. If the previous 4 commands show the appropriate output, then the SMB share is configured properly. Time to test. Resolution: Verify Step 4. Verify the distribution point physical path is correct. Resolution: Verify Steps 1-4. Verify the correct password is being used. Verify no firewalls are blocking access. Try connecting to the share from a Windows machine. If this step passes and you still receive an SMB error when trying to upload an image, then there is configuration problem with your Distribution Point. If preferred, the following steps can be achieved through a GUI instead of the cmd line. net share "cd_share=c:\program files (x86)\clonedeploy\cd_dp" /grant:cd_share_ro,READ /grant:cd_share_rw,FULL"